Sickle-cell anemia is an inherited blood disorder. Its main symptoms are long-term (chronic) anemia and episodes of pain. In the disorder, hemoglobin molecules in the red blood cells, which carry oxygen throughout the body, are defective. These defective molecules cause some of the red blood cells to change and form a sickle shape. These abnormally shaped blood cells are the source of the anemia and pain. Sickle-cell anemia is common among people whose ancestors come from sub-Saharan Africa, Spanish-speaking regions of the world (South America, Cuba, and Central America), Saudi Arabia, India, and Mediterranean countries such as Turkey, Sicily, Greece, and Italy. 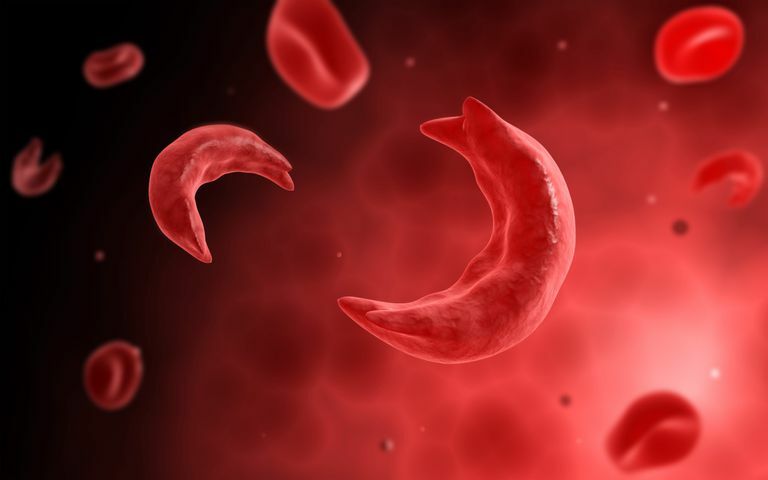 Once thought to be a rare disease, research now shows that in the United States, sickle-cell anemia occurs in about 1 in every 500 African-American children born and in 1 in every 900 Hispanic American children born. Approximately two million Americans carry the defective gene for sickle-cell anemia but do not themselves have the disease. However, if two people with the defective gene marry, there is a one in four chance that any child they have would have sickle-cell anemia. Most states in the U.S. perform a simple blood test on all babies born to detect sickle-cell anemia. If the test shows the abnormal hemoglobin is present, a second blood test is done to confirm the diagnosis. Pain: The sickle-shaped red blood cells are sticky and have trouble passing through small blood vessels in the body. The cells get stuck, clump together, and block the flow of blood. Blocking off the blood causes pain. This is called a sickle-cell crisis. Anemia: The sickle-shaped red blood cells die quickly. There are then not enough red blood cells to carry oxygen throughout the body. The result is fatigue, paleness, and shortness of breath. Delayed growth: Anemia slows the rate of growth because the body's cells don't get the oxygen they need to grow. Children and adults with sickle-cell anemia often have a smaller build than other people of the same age. Eye problems: The eye can be damaged by the lack of oxygen; it can be serious enough to cause blindness. Infections: People with sickle-cell anemia are more vulnerable to infections because of damage to their immune systems from the disease. Stroke: If the blood flow to a part of the brain is blocked by the sickled cells, a stroke can occur. Acute chest syndrome: Chest pain and fever caused by sickle-cell anemia can become a life-threatening complication. Pain from sickle-cell anemia is treated with pain-killing drugs and intravenous fluids. Most complications are treated as they occur. The anticancer drug hydroxyurea can reduce the frequency of painful sickle cell crises and of acute chest syndrome. Young children, up to age 5, are often given oral penicillin twice a day to prevent pneumonia. Blood transfusions can correct anemia, help prevent strokes, and treat spleen enlargement. There are, however, serious side effects to having frequent transfusions. Regular medical care is important for people with sickle-cell anemia. With good health care, people with the disease can be in good health and live into their mid-forties and beyond. Research continues to look for drugs to treat sickle-cell anemia. Scientists have developed laboratory mice that have sickle-cell disease similar to humans so new treatments can be tested. Bone marrow transplantation can cure the disease, but the marrow must come from a healthy matched sibling donor, and the procedure has many risks. "FAQs." 2007. American Sickle Cell Anemia Association. 27 Jul 2009.